Kawasaki Robotics is a leading supplier of industrial robots and robotic automation systems with a broad product portfolio, able to service a wide range of applications across diverse industries. Kawasaki Robotics (USA), Inc. is a subsidiary company of Kawasaki Heavy Industries, Ltd., Robot Division of Japan, and is headquartered in Wixom, Michigan, with sales and service offices in North and South America. Kawasaki has incorporated 50 years of experience as a robot industry leader into the development of the most technically advanced controllers and the highest quality robots. AUTOMATE is an exciting show because it is one of the broadest automation shows held in North America, which provides us a great overview of what’s happening in the industry. We have the opportunity to connect and interact with current and potential customers seeking NEW automation solutions. AUTOMATE also gives us a firsthand look at what’s NEW within motion controls, vision and other related technologies, which not only inspires our team to create new, innovative solutions for our customers, but ensures we’re knowledgeable of the cutting edge technology we can leverage in our business. We will be featuring our NEW RS007N/L general purpose robots as part of a deburring and high speed packing application. These compact robots feature the highest operating speed in their class and an increased work envelope through the use of a cantilever design for the upper arm. 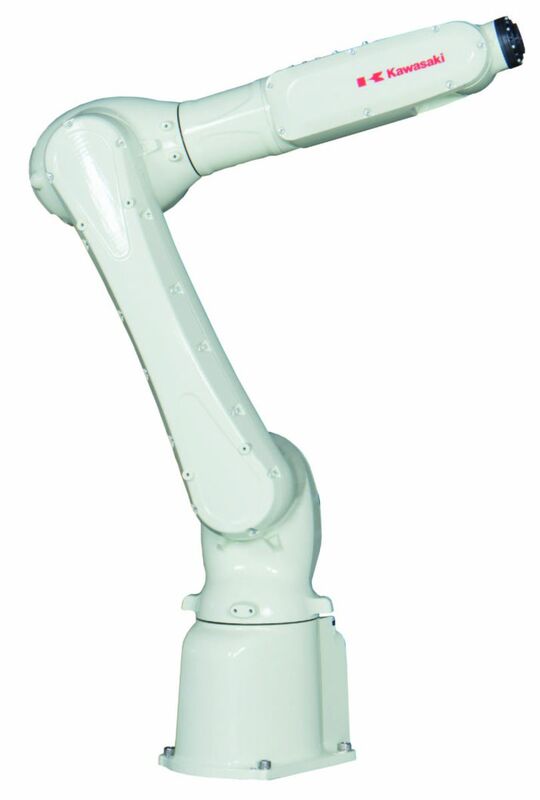 The RS007N/L robots come standard with our NEW F60 controller. This state-of-the-art controller helps manufacturers digitally connect their machines and extract value from the Internet of Things (IoT), and features enhanced data collection and transfer capabilities to support overall equipment efficiency (OEE) calculations and smart manufacturing . 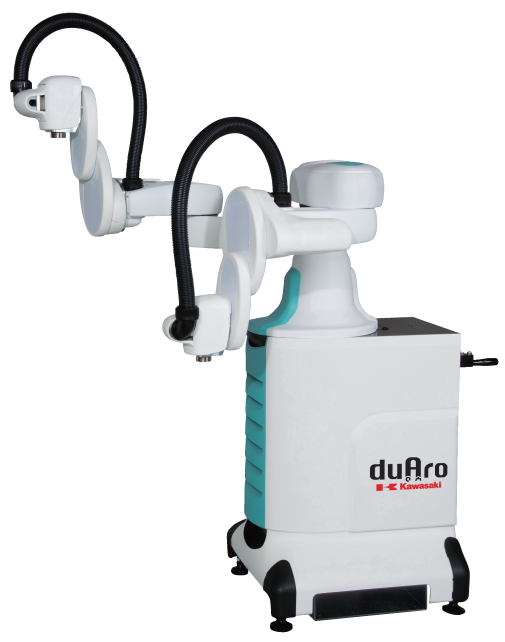 Our NEWEST addition to the Kawasaki collaborative robot family, duAro2 will make its debut at AUTOMATE. A newly developed wrist assembly has increased the duAro2’s vertical reach from 150 mm to 550 mm as well as its payload capability from 2 kg to 3 kg per arm (total of 6 kg). This allows the duAro2 to handle tasks that require vertical motion and a longer reach such as packing and rack loading. The mobile base of the original duAro’s arms accommodated the controller, however the duAro2’s arms can be detached from the base and the controller resulting in greater installation flexibility. The duAro2 comes standard with the NEW F61 controller which features a compact and lightweight design. The controller’s integrated 2D vision capability does not require a vision PC in production, only an optional camera and software, making it a cost-effective solution. We pride ourselves in always showcasing moving robots in real life applications, which creates an opportunity for attendees to envision our robots in their manufacturing process. Also included in our Automate line up is a collaborative duAro robot attendees will be able to interact with and interrupt, as well as our ice cream duAro which will serve free ice cream to showgoers. I’m looking forward to seeing it all; from what our competitors are doing to what NEW innovative technology is trending in automation. AUTOMATE provides a great opportunity to get a pulse on the robotics industry. Kawasaki robots are used in so many ways, from automotive manufacturing, to food production, to Silicon wafer handling; there are countless applications. Kawasaki’s goal is to provide robots with the highest quality and lowest cost of ownership to our customers. One way we achieve this is with our TREND Manager system that enables our robots to monitor their own health and provide a warning to the customer before an unexpected failure occurs. This provides tremendous benefits to manufacturers who want to minimize production downtime. I believe that AI will advance rapidly, enabling robots to optimize their performance and reduce the time to implement and program. Therefore, it will be easier and more cost-effective for manufacturers to automate their processes. As one of the leading robot companies in the world, Kawasaki has introduced and is developing several key technologies that will contribute to this trend.